According to the breeding regulations of the Akita Club Germany incorporated society our puppies are going to be dewormed, examined by the veterinarian, vaccinated, marked with a micro chip and the DNA is going to be analysed. The handover occures basically with the original pedigree, an acceptance report and valid vaccination cards. During the first weeks of their lifes, the upbringing of the puppies takes place in our house and the secured garden. This assures a constant social imprinting and affection as well as possibilities to retreat. If a puppy shouldn't have found a new home at the age of 8 weeks, it stays with us untill the new family is found or the future owner is able to pick it up. During this period of time we undertake the important task of imprinting and first education. Besides the responsibility for many years the potential buyers of our puppies should have basic knowledge of husbandry, education and feeding. 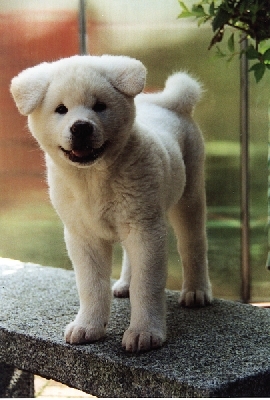 An Akita needs social contact, is even-tempered, high principled and calm, with high threshold. The distinct addiction of many Akita to hunt and to protect the owner, makes an authorian behaviour necessary and because of the dominance towards other dogs an Akita should not be taken for a walk by children alone. The education should take place with love, patience and appropriate consequence. If husbandry, feeding and education are appropriate to the dogs, the akita is an amazing companion. Therefore the attendance of a pet obedience school with every puppie is essential. In the local dog sports club playing courses for puppies and educational courses are open for all breeds. Regular dog shows, club meetings and conversations with breeders and race lovers are chances to learn more about the advantages and disadvantages of the Akita Inu and to learn how to assess their character.